For the amazingly economic price, hard to beat this outdoor set! Looks good and feels sturdy. The assembly was definitely a headache, need two people for sure. A number of holes were not-quite-aligned, so make sure not to tighten screws until you get everything in place. Overall, happy with this purchase! Hopeful it holds up to our mid-Atlantic climate swings. 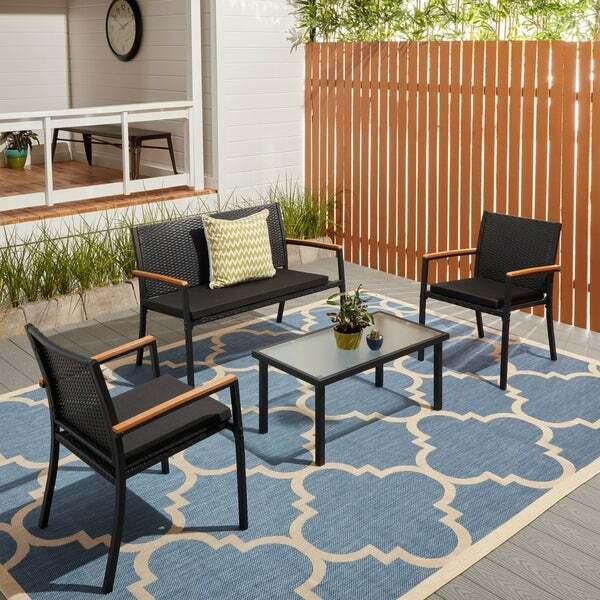 Enjoy relaxing with friends and family around this Lecco 4-piece outdoor chat set by Corvus. Crafted of powder coated metal and resin wicker, the chat set is weather resistant and UV protected for lasting style to stand up to the elements. The sturdy wicker and padded cushions offer comfortable support, while the compact design is perfect for a variety of outdoor settings. This set is very attractive and sturdy enough. We put an outdoor rug out and some throw pillow to match and it's just what we wanted. Love that it's black so that it goes with any color. A small set easy to put together.It is sound seating liked it so much i ordered another. I love this black wicker patio furniture! The look of it is awesome. The build quality is solid. The quality is good and it has held up well over the spring and summer. It looks great and my guests have complemented me on this set. They’re comfortable and very stylish! Way better than expected. Some of the reviews had me nervous but this was awesome and perfect for our deck. Love the wood arms and it’s way more comfortable than you would assume by looking at the smaller cushions. We are so in love with set and the price was perfect. Set is on the smaller side and I think it's more comfortable with cushions off. Good value. I'm going to be selling my house, and I bought this set just to stage the breezeway patio between my back door and my garage. The set looks fine, but the pieces do feel a bit flimsy. Fortunately, the chairs will probably not get much use, so I won't have to worry about them holding up. Overall this was actually a really good value and the set serves its purpose well. Bought this for the price and the few positive reviews. First issue I noticed was that several of the pieces were scratched, which is not surprising given that pieces inside were protected only with thin plastic bagging. The fake wood arm handles were also of poor quality. But, given the price, I could have lived with that if I had been able to assemble the chairs. I am handy and thoroughly reviewed the instructions; this was not user error. As I began assembling the first chair, I noticed that the supplied screws were poor quality and the allen wrench began slipping as soon as the screw was just beginning to tighten. Then, when I got to the setbacks, the two bottom screws would not thread. The supplied screws were simply not long enough. I checked 10 times to make sure I was using the right screw; I was. I even used a pipe wrench to try and squeeze the parts close enough to thread the screw; no dice. I finally threw in the towel, boxed it up, and called Overstock. No issues with customer service, a quick call took care of the return. I'm guessing there is inconsistent quality control given the price point - you get what you pay for! I'd suggest you keep looking past this one. I love this outdoor set. They are light weight but don't look flimsy. good for the price. It is a nice looking compact set. Our only complaint is that the cushions are definitely on the thin side. However, they are comfortable. I will be curious to see how they hold up after prolonged use. Looks Great, and is actually as stated. Love this patio set! Very comfortable and looks great! Looks great and is very sturdy. Assembly takes 2 people, or the use of clamps. Kind of time consuming! Great outdoor furniture, sturdy and looks great. The instructions to put it together were hard to read so I just winged putting it together, self explanatory. "Is there any wood on the arms of the club chair?" Yes, there is wood on the arms of both club chairs and loveseat. "Would this set fit on a "small and extremely windy" apartment balcony?" The set weighs approximately 70 pounds. I wanted a functional set - not expensive - as the weather can be harsh here. need another chat set for my outdoor patio space. The cushions on my current set need to be replaced, and it's cheaper to just buy a new set, then to buy replacement cushions. Hopefully, this will last 3 years or more, and I may not need the cushions that come with it at all. "Can I buy chairs separately?" Yes, the glass is tempered. "What is the weight capacity of the chairs and loveseat? Thanks!! ~Shirley~"
They can support up to maximum 300 pounds. Thank you. "Is it necessary to use the cushions?" The chairs are crafted from hand woven resin wicker, and the seat cushions can be removed. You can also sit on the chairs without using the cushions. Thank you. A backyard pool is the ultimate gathering place for friends and family during the summer. Use these five popular types of pool furniture to reinvent the look of your pool area and turn it into a backyard oasis. This handy guide will make the process of choosing outdoor furniture less intimidating. Shop and save on our great collection of outdoor and patio furniture. Even if you have a small balcony, deck, or patio, you can still have a beautiful arrangement of patio furniture. Planning how to fit your furniture into a tight space is a matter of choosing the right number of pieces and opting for space-saving designs. Whether you're creating an outdoor dining area or a place to lounge and relax, here are some small-patio furniture ideas to help you create the perfect arrangement. In warm weather, nothing beats gathering around a spacious patio table to eat dinner, throw a party, or spend time with your family outside. Before purchasing a table for your patio, there are several things you need to consider. Keep reading to make sure you get the perfect patio table for you. Just because your home doesn’t have the luxury of a spacious deck or patio doesn’t mean you can’t enjoy a beautifully put together outdoor space. Use these six simple furniture and decor suggestions to create a cozy outdoor nook that’s perfect for entertaining guests or simply relaxing. Nothing says summertime like a well-decorated pool deck that’s ready for warm sunny days and relaxing summer nights. While there are tons of fresh ways to style and design the area around your backyard swimming pool, read on to check out 10 of our favorite ideas for pool deck design and functionality. You don't need to spend a fortune to make your patio look and feel great. To help you find exactly what you want at a price that will fit comfortably within your budget, this guide offers 15 thrifty patio furnishings along with 15 high-end alternatives. While there are plenty of ways to make your poolside get-together great, we've put together a list of must-haves that no pool party should be without. Read on to check out our top 14 pool party essentials. Longer days, sunny skies, and warmer nights are ideal for outdoor entertaining.